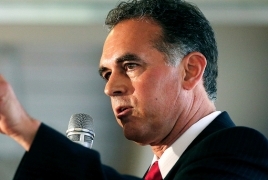 Armenian-American politician Danny Tarkanian who had the backing of U.S. President Donald Trump lost the race for House District 3 to Democrat Susie Lee. As reported earlier, Democratic state Assemblyman Anthony Brindisi, an American politician with Armenian roots, declared victory over Republican incumbent Claudia Tenney on Tuesday, November 6 night in the fiercely contested race for the 22nd U.S. Congressional District seat. Democrats Anna Eshoo and Jackie Speier, both of Armenian descent, are also projected to win the polls. Millions of voters flocked to the polls Tuesday to render their first national verdict on the Donald Trump presidency, and the results gave Democrats a House majority while Republicans retained their control of the Senate.